I don’t know how many people are aware that Mizuki Nana was formerly a part of the seiyuu unit called Prits. They released 3 singles and 1 album. While the group was not necessarily disbanded, their activity only lasted for one year (throughout 2002). The members consisted of Mizuki Nana, Kobayashi Yumiko, Kuwatani Natsuko, and Mochizuki Hisayo. But that’s not the point. The point is that, according to Nana-san’s latest blog post, the background vocals and chorus for one of the songs on Nana-san’s 21st single will be done by Prits. Admittedly, I’m not all that familiar with the other two seiyuu on Prits. I’m only familiar with Mizuki Nana and Kuwatani Natsuko (Fate & Arf! XDDD). I’m betting that the 4th song will be the opening song to MSLN: The Battle of ACES game. It has been confirmed on the game’s main website (and in various magazine articles) that she’ll be doing an all-new opening. That game is to be released on January 21st (on Nana-san’s birthday! XD) so the timing matches. Next is more radio shows featuring Nana-san as guest. GRAH! What is wrong with LJ??? It’s time like these that make me seriously want to move off to WP. ANYWAY. I jumped the official website as soon as I read the comment from . More info on the Kouhaku blog here. EDIT: I just read Nana-san’s latest blog post. If I’m not misunderstanding, then the countdown blog is a voice blog? I caught up on all the radio shows and now I'm amused. I know I don't talk about The World of M much, and that’s because there usually isn’t much worth mentioning (even though I still listen to it every week). This (last) week, however, is a different story. The Bring out your voice and read the following Japanese corner (aka Voice Acting Corner) on the World of M brought out a side of Nana-san that we’ve never heard of before. Nana-san attempts to portray a yandere character. Yandere!Nana: Good morning. Eh? What’s with that red scar? Eh? You were bitten by a mosquito? *evil giggle* It’s not good to lie. I see… It’s because of that woman again. Then… Once school finishes, it’s time for (your) punishment. Huh… It’s been a while since I last wrote about Mizuki Nana. But what can you do when life gets in the way? Here’s my attempt to return to my normal fandom life and get away from the depressing. HERE COMES THE BIG ANNOUNCEMENT! Except… Someone explain to me the meaning behind the PV… -__-;; How’d it turn into that? To be released on December 16, 2009. 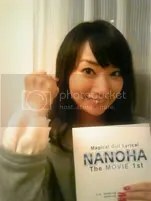 And… Nana-san’s most recent blog post (October 3, 2009). For some strange reason, seeing Nana-san so hyped up and excited over the Nanoha series makes me grin. Apparently, it’s a very important series to her – which many can guess because she made several references in her audio commentaries in her Live DVD/Blu-rays.